As China seeks to become an important player in the Arctic circle and curry favor with Greenland, the United States recently entered into a disagreement with Greenland over an American airbase there. That conflict could open the door for Beijing to swoop in and further realize its Arctic ambitions, according to Greenland media. The U.S. airbase in question is the Thule Air Base, located in the northwestern part of Greenland and home to the 821st Air Base Group, a unit of the 21st Space Wing. That unit, which is part of the U.S. Air Force, is tasked with giving early missile warnings and detecting any objects orbiting the earth to prevent them from colliding with satellites. Thule is the Air Force’s northernmost base, and has been under U.S. operation since World War II. Greenland is strategically important for the U.S. military, as the shortest route from North America to Europe goes through the Arctic island, according to Reuters. It is an autonomous constituent country within the Kingdom of Denmark. Greenland’s national broadcaster KNR, in an opinion article published Aug 30, called out the United States’ decision to contract Vectrus Services, a subsidiary of a Colorado-based company, to provide maintenance at the Thule Air Base, arguing that the company failed to cater to the needs of Greenland. 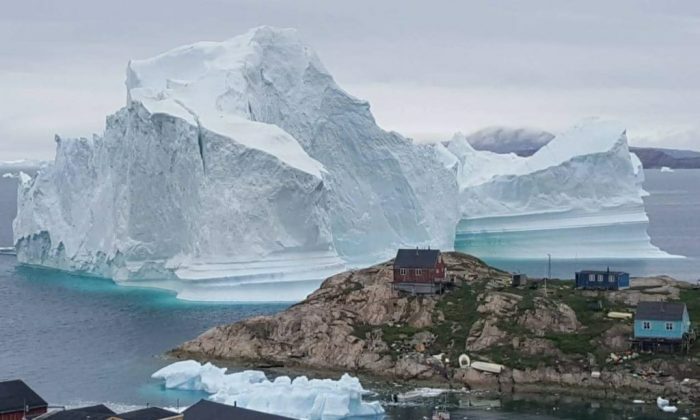 By not awarding the contract to a Greenland or Danish company, KNR said Greenland is losing up to several million U.S. dollars a year. The service contract for the Thule Air Base has historically been given to Greenland as an indirect economic subsidy, according to The Arctic Institute, a nonprofit arctic policy and research organization based in Washington. But, starting in 2014, a change in procedure allowed American companies to win the contract. In so doing, “When Americans save [money] on [Thule], they actually invite the Chinese to Greenland, thus undermining maybe the United States’ own position in Greenland,” Jon Rahbek-Clemmensen, an associate professor at the Royal Danish Defense College in Copenhagen, told KNR. Greenland is the world’s largest island but has a population of only about 56,000. While Greenland enjoys self-governance in some areas, including judicial affairs, utilization of natural resources, and policing, its foreign and security interests are in the hands of the Danish government—as stipulated by the Danish Constitution. It appears that the U.S. contract isn’t fully confirmed. Greenland’s foreign affairs minister, Vivian Motzfeldt, told KHR on Aug. 29 that negotiations are still ongoing. As the Arctic ice sheet continues to melt, the possibility of shipping through the Arctic has become a reality. This is especially appealing for Chinese shipping companies since it would reduce the time and cost to ship goods from Chinese ports to Europe, compared to traditional routes through the Suez Canal. For example, shipping to Hamburg, Germany, from Shanghai could take about 14 fewer days if cargo ships travel the Northern Sea Route, one of the three main Arctic shipping routes, compared to the route that goes through the waters of Southeast Asia and reaches the Suez Canal, according to Forbes. For the Northern Sea Route, ships leaving Chinese ports would travel north, passing the Sea of Japan and going through the Bering Strait, located between Russia and Alaska, before traveling through the seas above Russia—to finally pass through the Norwegian Sea and on to Northern Europe. China’s Arctic ambitions advanced when it became a permanent observer of the Arctic Council in May 2013. The council, consisting of eight Arctic states—Canada, the Kingdom of Denmark, Finland, Iceland, Norway, Russia, Sweden, and the United States—holds sovereignty over the lands within the Arctic Circle. “Permanent observers” are invited to Arctic Council meetings and are allowed to propose projects. In 2017, Beijing issued a document titled “Vision for Maritime Cooperation under the Belt and Road Initiative.” The plan, calling for an Arctic link between China and Western Europe, would complement China’s own “One Belt, One Road” (OBOR, also known as Belt and Road) initiative: proposed in September 2013, OBOR seeks to establish economic partnerships with Beijing and more than 60 countries across Asia, Europe, and Africa by building infrastructure projects. The Chinese regime’s ambitions were further outlined in a white paper titled “China’s Arctic Policy,” issued in January. The paper, which stated that the “Arctic situation now goes beyond its original inter-Arctic States or regional nature,” announced that China would participate in the governance of the Arctic, including making decisions on how to use Arctic resources via the Arctic Council and the development of shipping routes in the region. Some observers are concerned. Dr. James Jay Carafano, vice president for foreign and defense policy studies at the Heritage Foundation, wrote that China’s influence might not be benign. The article was published on GIS Online, a Liechtenstein-based publication, and reprinted by The Epoch Times. Carafano’s concerns include the possibility of China placing countries into “debt traps,” as was the case with Sri Lanka, which handed over control of its main southern port located in Hambantota after China financed the OBOR project. Sri Lanka was unable to pay back the $6 billion in loans and, thus, converted the debt into equity. China has considered Greenland a strategic part of its Arctic ambition. A Jan. 17 editorial by state-run media Xinhua pointed out that if China didn’t not look to other countries for cooperation, it would be too dependent on Russia, thus putting China in a weak position regarding the Arctic. Thus, Greenland should be critical to fulfilling China’s Arctic policy, given Greenland’s close proximity to the Arctic shipping lanes, the article said. Additionally, a closer relationship with Greenland would allow China to tap into its rich mineral resources, including uranium and rare earths, according to Xinhua. In April, Guancha, a state-run online news site, ran an article advocating for Chinese investment into Greenland to fulfill “its desire” to become an independent nation. In recent years, some political parties and individuals in Greenland have sought to gain independence from Denmark. However, a separation from Denmark would make Greenland the poorest European country. According to data from the World Bank, Greenland’s GDP stood at about $2.7 billion in 2016, less than the $6.75 billion registered by Moldova that year. Chinese companies have already made inroads into Greenland’s mineral market. For example, Shenghe Resources Holding, a publicly listed company—with the state-run Chinese Academy of Geological Sciences its largest shareholder—is developing rare earth, uranium, and zinc mines at Kvanefjeld, one of the world’s biggest multi-element deposits. The project operates in cooperation with Australian firm Greenland Minerals and Energy, according to Australian financial news site Proactive Investors. Not all Chinese investments in Greenland have gone through. For example, in April 2017, China’s plan to buy an abandoned naval base at Kangilinnguit was rejected by Denmark, because the latter didn’t want another country to gain a military foothold in Greenland, according to Reuters. Chinese investment to expand three airports in Greenland, which was first announced in March, was put on hold in June, after discussions between the Denmark and Greenland prime ministers, according to Reuters. In an Aug. 2 opinion article, Canada-based publication Geopolitical Monitor warned of Greenland’s increasing economic dependence on China. “China is skilled at and has a proven record of converting its financial investment to certain countries into political influence on multilateral institutions,” it stated.